Welcome to episode 01 of the Biceps After Babies Radio! I'm Amber Brueseke: a registered nurse, personal trainer, online fitness coach, wife and mom of 4. 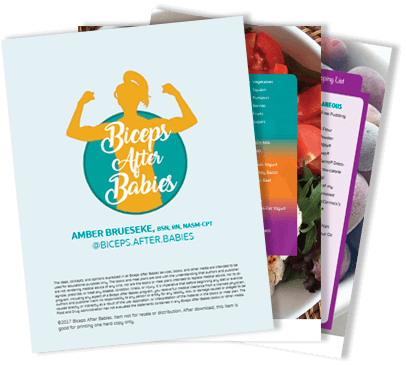 I started Biceps After Babies in 2016 and have really clarified my mission over the years to helping women feel confident in their skin and empowered in their lives through fitness and nutrition. Up to this point, I've mostly shared my message and mission on Instagram and Facebook but I have realized that I have SO much more to say than can be confined to a caption. Biceps After Babies Radio will be a place that I personally can teach, motivate, inspire, as well as share guests who will do the same. In this first episode I tell you what you can expect from the podcast and why I created this show. I tell you a little of my story so you can get to know me and why I am so passionate about fitness. To celebrate the launch of Biceps After Babies Radio, I am running a giveaway! If you go to iTunes and leave a review about the podcast you will be entered to win free enrollment into my online course Ditch the Diet. I will choose a winner on November 22nd so leave a review before then to be entered to win! I’m going to ask you to go to iTunes and leave me a review. Let me know what you think about what I’m talking about here. Leave me a review and you’ll be entered for a chance to win one of these prizes I have set up. And if you win, you’ll get to pick what prize you get. Thanks for listening, hit subscribe and check back each Tuesday for new episodes!